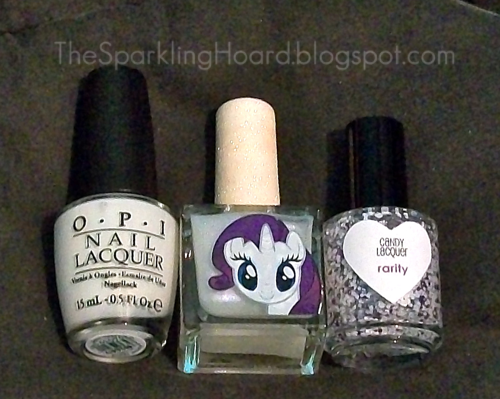 For this mani, I decided to use 3 polishes my fiance gave me for my birthday: OPI Alpine Snow, My Little Pony Rarity, and Candy Lacquer Rarity (to make my life easier and avoid confusion, I'll refer to them as MLP Rarity and CL Rarity). 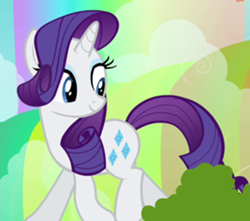 Rarity is Ponyville's resident seamstress and fashion designer. She loves the finer things in life and I'm sure she would totally freak out over all the polishes named after her if she were, you know, real. My Little Pony Rarity is a shimmer topper. 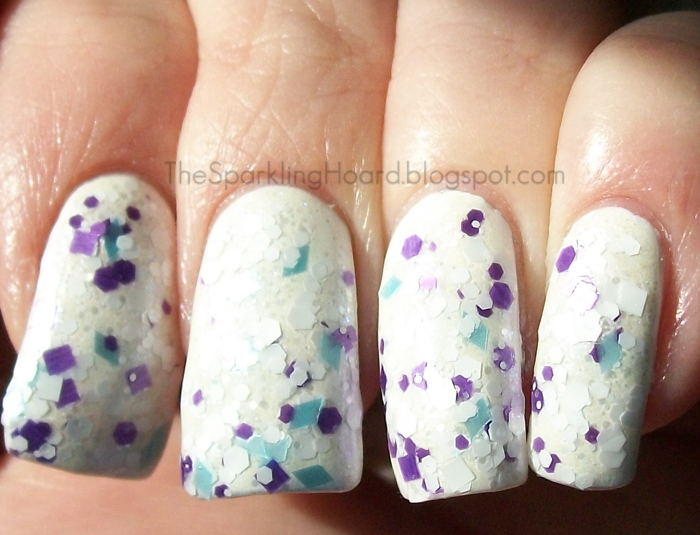 It features tiny blue, pink, and purple shimmers in a sort of creamy, whitish, yet also somewhat clear base (like a barely there white, frosty pearl sort of thing, which mostly alters dark colors). It was easy to work with, though it dries slowly and is damn near impossible to photograph on the nail (got a decent bottle shot, though!). It looks like it's designed to serve as a topper to Rainbow Dash (a bright blue creme), Pinkie Pie (a bright pink creme), and Twilight Sparkle (a pinky-purple creme). It does not look like polishes were made for Fluttershy or Apple Jack (2 of the other main characters). It's a very pretty shimmer! Candy Lacquer Rarity is a very literal interpretation of Rarity...like if you were to puree Rarity (how horrifying lol), this is what you would get. CL Rarity is made of multiple sizes of white and purple hex glitter, purple squares, and icy blue diamond glitter. It's packed with glitter, so it can be a bit thick and the glitters do clump up a bit (not too annoying, though, and thinner may improve it). Dry time was average. I used 1 coat. Such pretty shimmer in MLP Rarity! OPI Alpine Snow costs $9 for 15mL and can be found at Ulta. You can stay up-to-date on OPI news on their Facebook page. My Little Pony Rarity normally costs $7 for 0.61 fl oz, but it's currently on sale for $3.50! You can find it at Hot Topic. Candy Lacquer Rarity costs $8.50 for 15mL, though I'm not sure if it's still available. At this time, Candy Lacquer's online store is down for maintenance, but you can find it HERE. You can stay up-to-date on Candy Lacquer news on their Facebook page. All products purchased for me by my fiance. Thanks, hun! Looks like I'm going to Hot Topic this weekend! Love Candy Lacquer's Rarity, too.